With any drawing I think the hard part is trying to figure out when it’s done. I chose to let the top and left side of the image be more open, while compacting more line work in the middle and with the figure. Thought I’d drop a sketch I did on my I-Pad this summer on here this morning. I wanted to experiment doing an image that looks like a pen drawing when I was working on this. The advantage of the I-Pad was I could easily work back in on the image with the actual color of the background, so I liked the effect of drawing with the background color as well. Regarding the content, for this one I began it while at intense men’s weekend I was staffing. Let’s just say I was in a position of leadership and was working through that. 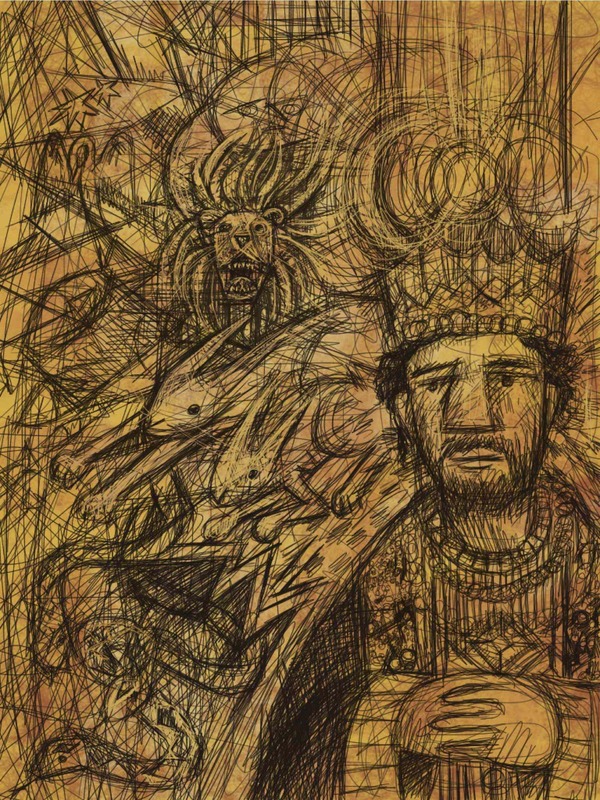 This entry was posted in Art in the Works, Thoughts and Sketches and tagged drawing of a king, I-pad drawings, King sketch, sketchbook pro. Bookmark the permalink.